Mountain biking is a relatively new sport. Long-standing American pastimes like baseball, football, and basketball have thick record books, and a near stranglehold on the sports culture and focus in the United States. For generations, kids have dreamed of playing left field at Fenway Park, and adults have escaped war, economic depression, and the drudgery of every day life watching those kids live out those dreams. But that is starting to change. More and more kids in the United States are dreaming about racing bikes, rather than putting on baseball cleats. 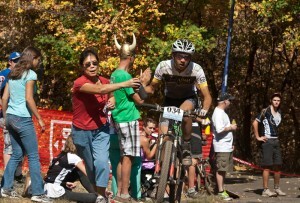 Mountain bike racing, once thought as a fringe game for fringe people, is gaining momentum and devotees of all ages. The opportunity to participate and excel as a bike racer is extending deeper into our communities. Clinics, camps, race leagues and series are bringing cycling to more people, and in more places–regardless of age, ability, or income level. Instead of spending Saturdays at stadiums, kids are racing bikes on singletrack. The National Interscholastic Cycling Association (NICA) has harnessed this growing wave, and has given high schoolers a sanctioned, organized outlet for racing, while also involving parents, schools, and communities. The result has been an overwhelming enthusiasm for mountain bike racing among teenagers, an enthusiasm that will evolve into a life-long commitment to mountain biking and cycling. Bringing a NICA-sanctioned high school mountain biking league to Utah was no easy endeavor. It took countless hours of work, and constant focus, determination, and cooperation. All of the effort came to magnificent fruition on September 8, 2012 at Round Valley, Park City when 350 teenagers lined up for Utah’s debut high school race. The energy at the race was tangible. Everyone, from racers and coaches to parent and spectators, knew that history was unfolding in real time, and that mountain bike racing in Utah would never be the same again. “Being a part of the first year of high school racing in Utah was awesome!” said Jake Van Wagoner, a senior from Lone Peak High School in Alpine. A small portion of the racers, like Jake, were experienced riders. But the majority were novices. Many had never raced before. A few were new to riding altogether. But the lack of experience hardly translated to a lack of competitive aspirations or sheer fun. As the races that day unfolded, it was clear that the spirit of mountain bike racing had found its way into the hearts of the kids, evidenced the by sprint finishes, stomped pedals, and dusty faces. The past racing experience–if any–that each of the kids had meant very little. After that first race, they were all mountain bike racers, seasoned and savvy. And from there, the racing, and the racers, only improved. By the end of the inaugural season, riders had been transformed from timid beginners to determined competitors. Riding skills were increased, fitness gained, and perhaps, most importantly, self-confidence was solidified. The toughest kids at schools throughout Utah have number plates on handlebars, instead of numbers on football jerseys. Each rider on every team contributed to his team’s success. In NICA mountain bike racing, there are no benches, no backups, and no one left wondering if they’ll ever get a chance to prove themselves. Instead, everyone races. And everyone who finishes the race scores points for his team. The most ardent supporters of the kids on course were their own teammates. It was immediately obvious at that first race that something special was happening, and that these events were more than just bike races. They are the future. The future of the local bike industry, races, and cycling culture was materializing before our eyes. Parents were inspired by their kids, coaches were excited by the second efforts, and the riders were awestruck at each other. “I was really stoked to see how many kids were racing. I had no idea how big the league was until that first race. We set a record for the biggest first year-NICA league. That’s pretty cool.” recounted Jake. It’s been said that mountain bike racing is waning in popularity. Whoever says such a thing hasn’t see any of the Utah high school races. The future is here, and it’s filled with bright, doggedly determined bike riders. Cycling among kids is on the rise, and unless you’re a football coach, that should make you very, very excited. 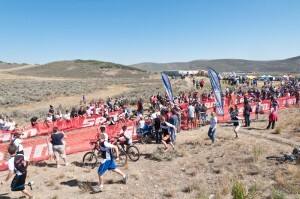 For more information about high school cycling league, visit www.utahmtb.org and www.nationalmtb.org.